Why Landscape Your Pool Area? Installing a new pool at your home is one of the most exciting upgrades you can make to your property, by increasing its value considerably. You are not only creating a pool area where you will be spending a lot of time, but also expanding on the look and feel of your home. For this reason it is worth going the extra mile by having the area professionally landscaped to complete the finishing touches on your personal piece of paradise. At NQ Pool Warehouse, we appreciate the opportunity to provide the full package for your pool area, complete with paving, landscaping and fencing. We enjoy the opportunity of seeing the smile on your face as we walk away knowing that you are completely satisfied and ready to start enjoying your beautiful new pool zone. For more information about a personalised pool package to suit your tastes, give us a call and talk to us today about how we can help. Having your pool area landscaped can provide shade from the sun around your pool area, creating spaces where you can rest in the shade after your swim. 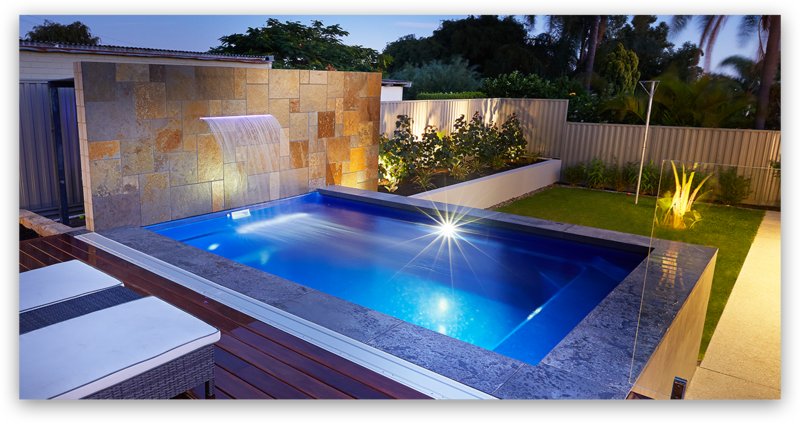 Our NQ Pool Warehouse landscape contractors are experienced landscaping experts who can advise you on which trees would provide the maximum shade, with minimum mess to fall into the pool. What better way to enjoy nature than from the comfortable position of floating around, or lounging beside your beautiful new, crystal clear pool area. Choosing particular plants and flowers will encourage beautiful birds, bees and butterflies to come and visit, so you will be able to enjoy the feel of nature while enjoying a daily swim. Professional landscaping of your pool area provides a finished look to the property, and shows visitors that you really appreciate the finer things in life. The value of a property increases considerably with the addition of landscaping, water features and paving around a pool area, and makes the place feel like somewhere you will want to spend more time. If you live in a particularly busy area, the addition of landscaped gardens with the visiting birds and insects can serve as a buffer to the noises from the outside. Depending which trees you choose, the plants and animals that nest within them can soften the sound of outside noises, ensuring that your pool space is an oasis of peace away from the hustle and bustle of the world outside.